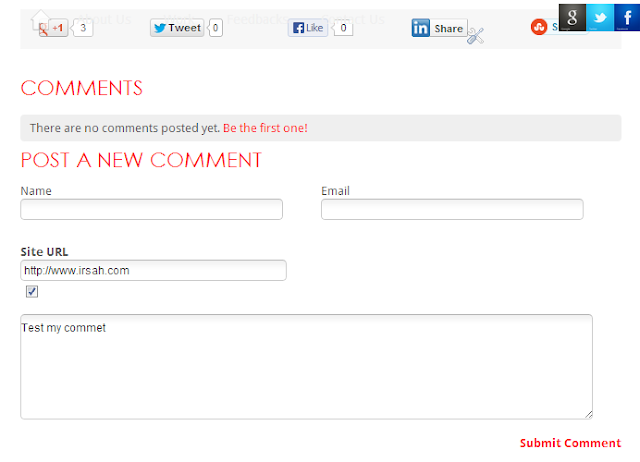 Commenting system is one of the best ways to interact with your users / visitors / potential customers at your blog or website, Intense Debate has made it super easy to customize the look and feel of their comment system for Blogger with CommentLuv plug-in activation. There are several ways to customize your Intense Debate comments layout and design, either inserting the custom CSS styles in your business blog / blogger store template or you can host it with intense debate Custom CSS style features that comes with your free account. Here we're about to walk through on how to include custom CSS style / codes for your Intense Debate commenting system for Blogger, and have more control to "co-exist" with your Blogger template overall design and layout. Inspired by minimalist-styled design, we've skinned unnecessary / unwanted default Intense Debate comment features, hopefully it would help speed up Blogger template loading, and looks professional just like established websites / blogs do. It will also makes it easier for your blog / website users / visitors to comment on your posts and create healthy links and hopefully build more interaction and traffic. Go to Intense Dabate website and log-in into your account. Head over to Sites > select your blog which you have activated / configured / associated with Intense Debate comments. Click Save Settings > and preview the modified Intense Debate design / layout at your blog. In addition you can also select CommentLuv Plug-in, and clean out unwanted add-ons from Intense Debate default styles, by inspecting your dashboard customization features. By hosting the CSS style codes here at Intense Debate, normally, changes / customizations will take effect immediately. You can edit to specify and detail out your customize Intense Debate looks just by editing and saving the settings here and preview at you blog / website. Open your favorite text editor. Preferably a new file. Copy the above CSS codes and paste it in your text editor body > click save and make sure the file extension will end with " .css " . After determine your url file, paste the full url in the Intense Debate > Customm CSS section > under URL to External Stylesheets area > click Save Setting. In addition, you can also check your server configurations ie, robot.txt files, if it has been configured to allow robots access, permissions etc, to the folders and files you have just specified. The custom Intense Debate with CommentLuv plug-in design can be viewed here in our blog and on our website. We hope these workarounds will help you customize useful comment plug-in like Intense Debate, to suit your overall blog / website / blog shop / store layout and design.